Infrastructure, Amjad Ali Khan College of Business Administration :: Muffakham Jah College of Engineering and Technology, Banjara Hills, Hyderabad. The College with its infrastructural amenities, magnificent auditorium, seminar halls, lush green campus make it an ideal learning place for postgraduate students. The MBA programme has a well-stocked library with more than 10,000 books, including Online Public Access Catalogue System (OPAC) which provides a one stop access to library collections, CDROMS, databases, international journals, magazines and training kits. 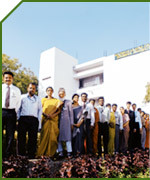 A full fledged Computer Centre with more than 40 systems and round the clock internet access is provided to the MBA students. Networked computer labs are used for both teaching and open access computing needs of the staff and students. In addition to these subjects, students have to undergo summer placement training for two months and submit a project in partial fulfillment for award of MBA degree. The sports and recreation centre caters to the sporting and recreational needs of the student community. It organizes various intramural and intercollegiate sport activities and games for students and staff. The college has a full fledged placement cell to cater to the needs of successful students for projects and placements.